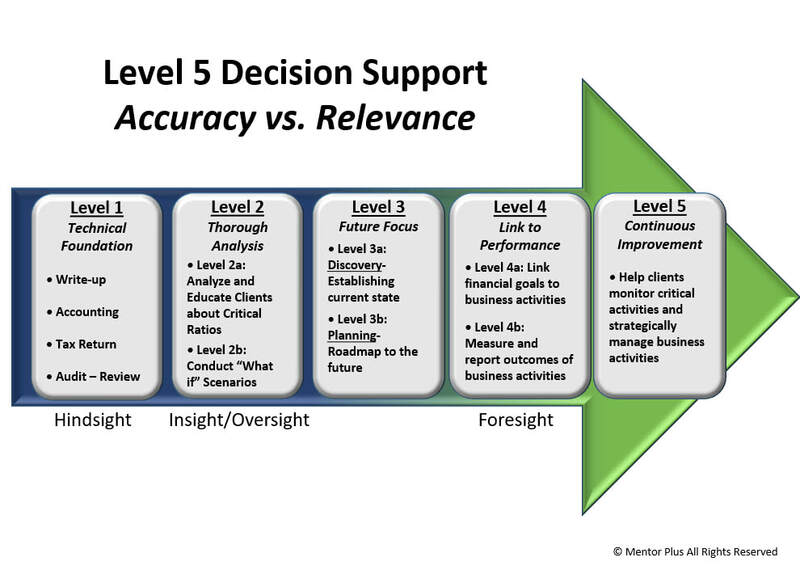 The Level 5 service framework (described in the pages that follow) is a proven advisory approach for accountants that can be leveraged across clients of all sizes and industries. ​By learning how to change your mindset, leverage your skill set, and expand your tool set, you will become the kind of advisor your clients crave. Few firms ever progress beyond Level 1 services. With these tools, you can provide the kinds of proactive assistance that helps your clients make sense of their numbers, create actionable plans, and achieve their financial objectives. After more than 20 years of being available only in live sessions delivered over 8 days, the Mentor Plus comprehensive Level 5 Certified Advisor training program is now available online. This online training is a repeatable protocol for accountants to use with their clients. It features more than 100 educational resources including hands on tutorials and tips on selling your services. Armed with these tools, you can recoup your entire investment in a single client engagement.